AAS metabolism burdens the kidneys through the process of glomerular filtration in the renal parenchyma. 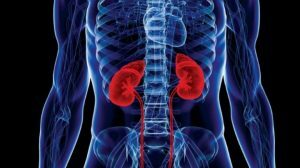 The creatinine serum level, which is a reliable indicator of renal function, increases (> 1.5mg/ dl), as well as urea (>80 mg/ dl) and uric acid (>7.5 mg/ dl). All these biochemical parameters are affected from several othernon-renal factors (state of hydration, vegan diet) and their levels will not be raised above the normal range, until 60% of total kidney function is lost. So, the most reliable indicator of renal function is the measurement of creatinine clearance (GFR) at 24hrs. Focal segmental glomerulosclerosis is a condition in which there is focal scarring of some glomeruli within the kidneys. It affects majorly the filtration process,leading to proteinuria, edema in the face and lower extremities, hypoalbuminemiaprogressing to end-stage renal disease. Clinically, the patient presents with edema in the face and lower extremities (proteinuria, hypoalbuminemia), hypertension, oliguria or even anuria (urine volume<500ml/24h). In microscopic urinalysis proteinuria, microhematuria and cylinders are present. [2-4, 6, 7]. GFR falls, creatinine elevates and the kidney is unable to perform its normal excretory functions. This causes disruption of electrolyte regulation, leading to a further rise in potassium levels. Hyperkalemia might lead to heart arrhythmias, such as atrial fibrillation, or ventricular tachycardia. In rare cases, abuse of AAS has been associated with the development of kidney tumors (nephroblastoma, adenocarcinoma). Creatine monohydrate with loading doses of 20 g/day for 5 days and then maintenance doses of 5 g/day are considered to be safe, always with proper hydration. Moreover creatine consumption affects creatinine’s serum levels, since it is metabolized into it. Creatine is an ingredient of red meat; therefore its consumption will also increase creatines concentration. Protein consumption tends to be diuretic, in the absence of carbohydrates and in such cases ketosomes are detected in a biochemical analysis, leading to exhalation of ketones (rotten apple smell). During precontest preparation and glycogen depletion phase, high consumption of animal protein (>3gr/kg), leads to ammoniaimia (skin and sweat get a characteristic heavy odor of ammonia). As known, ammonia is a waste product in urea cycle, being toxic to brain’s function (hepatic encephalopathy). High protein consumption produces anacidic environment in the kidneys (pH<5). That, along with calcium retention from nandrolone abuse, could be responsible for the formation of kidney stones. Greater body mass (BMI> 30)leads to higher glomerular hyper-filtration, which in time leads to mechanical strain and scarring. When BMI is raised and over-training occurs, rhabdomyolysis is more risky since more myoglobin is released into plasma. Bodybuilders, usually exposed to forced muscle gain, diets high in protein and creatine, polydrug abuse should be considered a high?risk group in particular. Continuous renal function monitoring and early detection of kidney injury is very important for AAS users. 1. Nephrotoxic effects of common and emerging drugs. Pendergraft WF, Herlitz LC, et al. Clin J Am Soc Nephrol 2014; (9): 1996–2005. (https://www.ncbi.nlm.nih.gov/pubmed/25035273). 2. Development of Focal Segmental Glomerulosclerosis after Anabolic Steroid Abuse. Leal C. Herlitz,Glen S. Markowitz, et al. J Am Soc Nephrol. 2010; 21(1): 163–172. (https://www.ncbi.nlm.nih.gov/pmc/articles/PMC2799287/). 9. Anabolic steroid abuse and renal cell carcinoma.Martorana G, Concetti S, et al. J Urol.1999 Dec;162(6):2089.